Welcome to A Sampling Bee! Today, I am sharing with you a yummy recipe that I got to make with Dean's® DairyPure® Sour Cream- Roasted Veggie Dip! This recipe is loaded with roasted corn, roasted peppers, roasted zucchini and spices. A delicious summer dip that can be enjoyed on hot, summer days. Scoop up this yummy dip with tortilla chips or sliced veggies! 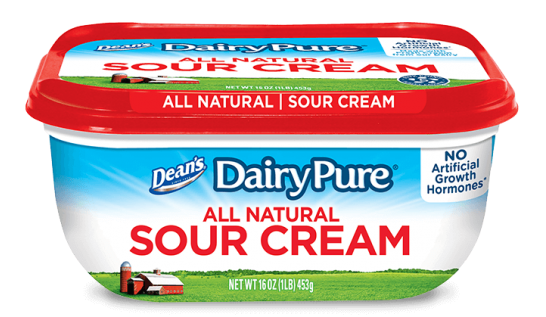 Dean's DairyPure Sour Cream is a delicious sour cream that is all-natural and is made with NO artificial growth hormones. It's a rich, creamy sour cream that is the perfect addition for any meal. 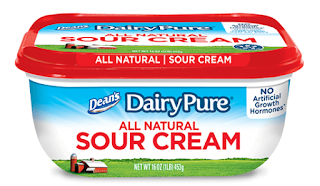 Dean's DairyPure Sour Cream is made with fresh milk and cream which comes right from their own dairy. Add a dollop of Dean's DairyPure Sour Cream to the top of your soup or nachos. All milk is tested for antibiotics. Continually quality tested to ensure purity. Only from cows fed a healthy diet. Cold shipped from your trusted dairy. Roast peppers, corn and zucchini on the grill or on a stovetop grilling skillet. Rotate every 5 minutes. Cook until tender. Let roasted veggies cool slightly. Cut corn off the cob. Cut peppers and zucchini into pea-sized pieces. Measure out ingredients and place them into a medium sized bowl. Add sour cream, salt & pepper to roasted veggies and mix gently. Pour dip into a bowl. Add parsley if desired. Serve with chips and/or sliced veggies. Enjoy! This was my first time using Dean's DairyPure® Sour Cream but not my first time using the DairyPure Brand. I have tried their milk and previously worked with the company to create an overnight oats recipe using their milk. DairyPure products are great! The sour cream is the best sour cream that I have ever used. I am a huge sour cream fan and the dip I made turned out so good! My Roasted Veggie Dip is a cool, refreshing dip. Make some for your next summer party. Visit http://bit.ly/2t7PhH1 to find DairyPure® products near you! Products differ in certain regions. **Compensation for this post was provided. All opinions written here are my own. Want to save on Dean's DairyPure® Sour cream on your next shopping trip? visit http://bit.ly/2tfousm and grab a coupon for 40 cent off one 16 ounce sour cream! Looks so good, I would like to make a kosher version! I haven't tried this brand before. I love dips with sour cream, and I also generously spread some over my tacos. I will look for Dairy Pure in our local store tomorrow. Thanks for the review. This sounds like such a great dip! We love Dean's products! They really do have wonderful products. We will have to try this recipe. Yummy, I love dip and this recipe looks super great! Such a good idea for snack. What I love about the product is that it is all natural and no artificial growth hormones. Need to check this out and try. I love DairyPure, their sour cream sounds really great. It is so incredible the ingredients that can be in foods nowadays, it is so important to be in the know.